Rating: 7.4/10. From 268 votes. Like the Beretta 90-Two, the Beretta PX4 Storm has three different trigger modes (double-action/single-action with safety-decock lever, double-action/single-action with decock-only lever, and double-action only) and an adjustable grip that uses three interchangeable backstraps that make the grip large or small. I tested the double-action-only model, which was very sleek with no sharp edges or corners to snag during the draw or on clothing when carried concealed. The PX4 Storm from the right. One of the more unique features of the Px4 is the rotating barrel that keeps the bore in alignment with the target at all times. Instead of dropping out of the way like many barrel designs, the Px4 Storm barrel rotates as the slide moves to the rear, which unlocks the action. This design reduces friction between the barrel and slide, increasing the smoothness of the firing operation. This also helps keep the bore axis low over the shooting hand, which gives the Px4 better pointing capability as well as helps get the gun back on target more quickly for faster follow-up shots. The polymer frame helps keep the Storm’s weight to 27 oz. The front and back straps offer the same fish-scale checkering as the 90-Two. The grip is considerably trimmer than the 90-Two, and when you install the small back strap, a shooter with the smallest of hands can use the gun. The magazine release button is totally reversible, making this gun totally ambidextrous, with the exception of the slide-stop lever. The dust cover of the polymer frame has a rail built in so that you can easily mount white lights and laser sights on the gun. The rounded trigger guard, forward-cocking serrations and tapered sights give the pistol a very sleek appearance. The sights are of the standard three-dot variety, but are coated with Luminova photo-sensitive material that gives the dots a glowing capability five times as bright as tritium for about 30 minutes after exposure to any light source. The dots remain usable in low light for hours, and only need another brief exposure to regenerate. The slide is treated with Beretta’s Bruniton non-reflective black coating. 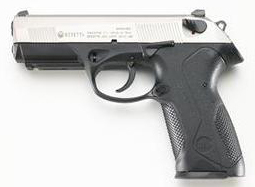 Update: Beretta has released an Inox model, which features a slide bead-blasted into a smooth, satin stainless finish. The Inox is available in 9mm and .40 SW. The double-action-only trigger of the Px4 Storm is very smooth with an easy-to-use first-trigger weight of 8 lbs. Subsequent trigger pulls require a full release of the trigger to reset, which I found to be a bit disconcerting when trying to shoot fast. On several occasions, I short-stroked the trigger, failing to reset the sear, which does not deactivate the gun but does require another release of the trigger to pick up the hammer-sear engagement. This would slow your rate of fire, and could be a problem in a close-quarter confrontation where fast, accurate shots are needed to end the fight. This is not an indictment of the gun, but merely an observation, and it’s a concern you can solve with proper training. The Px4 Storm proved both accurate and reliable. Like the 90-Two, the Px4 went through 300 rounds of .40 SW hollow points without a hiccup. It was also capable of holding all rounds inside a 3″-circle at 15 yards when fired from an unsupported, hand-held stance. If the Px4 possessed a shorter trigger reset, I would carry it as my personal sidearm—I liked it that much. To read Spaulding’s review of the PX4 Storm Compact, click here. To read Mike Boyle’s review of the PX4 Storm Sub-Compact, click here. 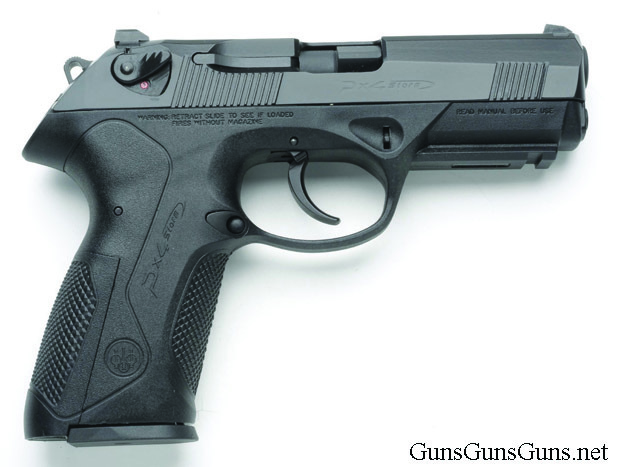 This entry was posted in .40 SW, .45 ACP, $251-$500, $501-$750, 9mm, Beretta, Full size, Semiauto and tagged Handgun Reviews on June 16, 2011 by Dave Spaulding. I have a Beretta Px4 Storm type C, 40cal. It is a good shooting gun, the trigger took a little getting used to. I do enjoy shooting this gun now and do so offten. Thanks to the rotating barrel the Px4 has better kick than most of the hand guns, at least for me. Any way of shortening that reset travel-it’s the only thing I dislike about this gun? After 11 hrs. classroom instruction, the 20 or so people in our CPL class last weekend all had their prize pistols out on their table waiting and buying ammo before we assembled to go into the practice range. A lot of nice comments about the good looking Sigs, Rugers, Taurus’s, and especially Glocks. When I finally opened the case with my full size PX4 Storm Inox .40 it immediately became the center of everyone’s attention. They all pretty much came over to comment/admire, including one of the veteran Firing Line instructors. I’ve found that it shoots as good as it looks. I know its a matter of personal opinion but if you’re on the line about a PX4, I thought I would share my thoughts. It has a great blend of looks and performance. I have the px4, DA/SA and the long triger pull is only when the hammer is seated to the firing pin, once the gun is fired the trigger need only be releases a 1/4″ not the full length of travel, that is one of the reasons I like it so well, because after the first round the gun goes to SA. I love this gun, and all my freindsz that have fired it have raved aout how accurate is was, as well as the ease of reaquiring target after your shot is fired making for better groupings. I like it so well I want a compact model ! Great gun, I’ve retired my LC9 for concealed carry. Everything I’ve fed it (almost 500 rds.) has worked but my favorite is Hornady Critical Defense. Love the pistol, trigger is tricky but not overly so and it is very accurate at 25 yards. Agree this is an awesome gun. Had a problem w stiffness of the mag release when reversed, but newvlube helped. SA trigger pull is just too heavy, but everything else is spot on. (Would like a fatter grip option) Have even fired it w/out earplugs to test-no pain. Use Critical Duty for carry ammo in Plus P, but shoots anything for target practice. I agree wholeheartedly w the excessive length of the reset being a problem, hopefully they’ll come up w a fix, though I’ve never missed a shot due to that. Should mention mine is a nine, and even w Plus P has minimal kick. ust shot my Beretta PX4 Storm today. I had shot one before but it was a police trade in and well used. Mine is a Full size Beretta PX4 Storm, in .45 ACP. I put a 100 rounds through it today. Not one jam, misfire, or problem. It shot a tad low so I had to drop the rear of the gun a little, then It was dead on. Given the twist of the barrel, vs. tilt and drop of the barrel, there was less deviation from the target. Plus, the recoil was that of a 9 mm. Anyway, this is one of the best handguns I ever owned. Plus it was so easy to clean. This hand gun should be in every house, in the hands of each police dept and in every branch of the service. Everything was perfect on this gun: Recoil, handgrip, accuracy, and high capacity, and the price. I bought my PX-4 STORM second hand with 50 rounds through it the guy as selling had second thoughts. I had cash in hand I would not take twice the money for this gun i love it and my wife has no problems shooting it in 40 cal when I’m not carrying it she is \> I carry it every day. In the age of striker fired guns all this nicely made pistol has going for it is lots of safety. I have the decocker / safety model. When I got the pistol the DA first shot was 12 + pounds. Its really difficult to get a good shot off under stress with such a looooong, heavy DA pull. The single action is good with a little creep and about a 4.5 pound let off. I liked the gun. Feels good, shoots great in SA but the DA pull was pretty bad. After checking on the internet I found you could easily swap out the 12lb hammer spring for the model 92 8 lb hammer spring. It cost $4.. That dropped the DA first shot to about 8.5 pounds which is much better. But its still not an M&P with an Apex sear. I like the safety of the Safety / Decocker where you can operate the gun to clear the action, or chamber a round, or re-holster in absolute safe condition. but I still don’t like that first shot. Reliable, fells good and the rotary action works great. Have never had a malfunction of any type. Fun to take out and shoot, but if I needed a defensive gun, I would not pickthis one.